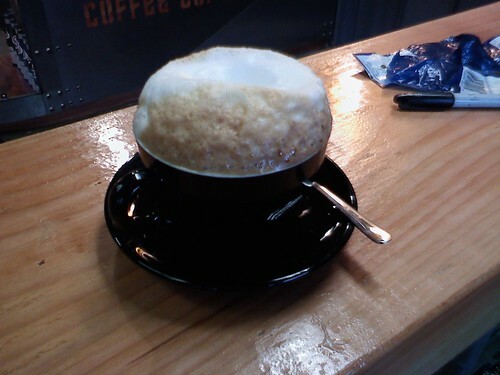 Yesterday, I visited the the combined Satellite Coffee and Smooth and Juicy bar which has just opened. They are located in the same building as Embellish. 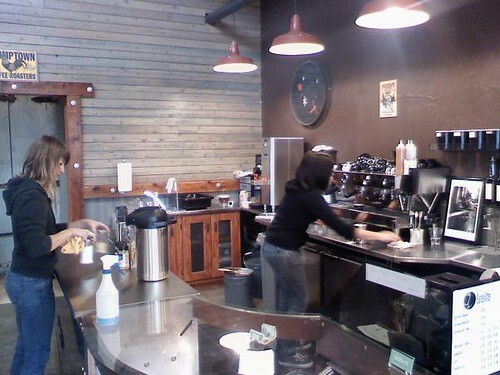 This is the third Satellite Coffee to open in Tacoma via Pat Brown. 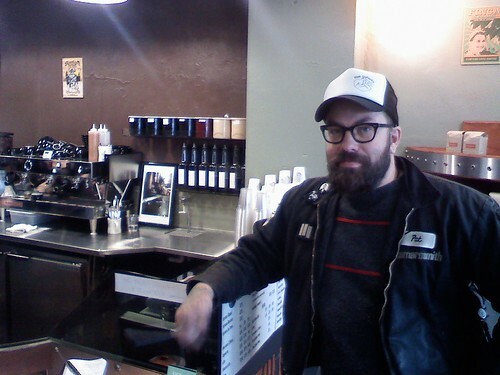 Pat Brown, now owner of his third coffee shop in Tacoma. Location: 1122 Market Street in Downtown Tacoma. Read more on the Volcano. 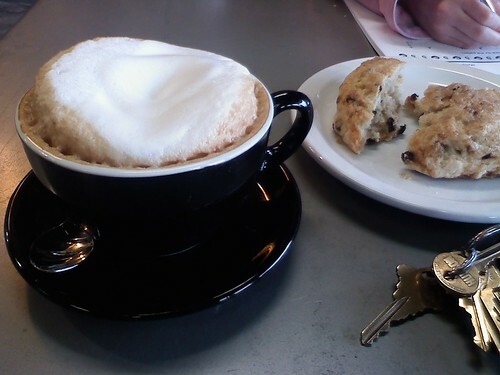 Could coffee pave the way to Tacoma's revitalization in 2010? by NineInchNachos on 1/4/2010 @ 7:56am glad to see some businesses doing OK! by Erik on 1/4/2010 @ 9:22am "glad to see some businesses doing OK! " by Heatherrebel on 1/4/2010 @ 9:22am High-tech and naturalistic at the same time. Love the chrome and wood--Looks like the ultimate Northwest scene. by Emilie has one foot on shore on 1/4/2010 @ 9:48am nice! a Satellite within walking distance of my downtown job. Congrats to Pat! by Crenshaw Sepulveda on 1/4/2010 @ 10:50am Maybe this will persuade Daniel Blue to not leave Tacoma. Clearly this Satellite Coffee / Smooth and Juicy development should be pushing Daniel Blue back in. by fredo on 1/4/2010 @ 11:29am They've got some cool posters around town featuring an image of an expresso machine robot. Probably got the idea from RRs recent 24 hour cartoon submission. by Erik on 1/4/2010 @ 12:03pm Maybe this will persuade Daniel Blue to not leave Tacoma. Looks like the new coffee location opened downtown just in the nick of time. by NineInchNachos on 1/4/2010 @ 12:08pm it's a great poster. if anyone knows how to contact the illustrator let the CLAW know! by jenyum on 1/4/2010 @ 3:44pm Went today. 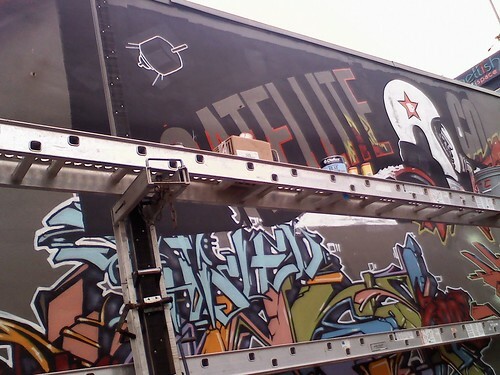 Satellite's coffee is as amazing as ever, they really impress me with their ability to expand and hit the ground running. 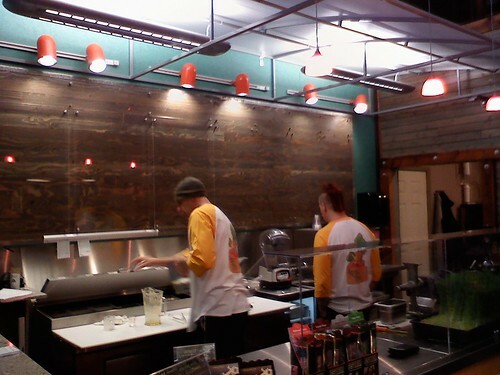 Smooth & Juicy is still closed, sign says they'll reopen tomorrow when re-stocked. by L.S.Erhardt on 1/5/2010 @ 11:30am Any word on quality of their hot chocolate? by Crenshaw Sepulveda on 1/5/2010 @ 11:34am Hard to get a good cup of hot chocolate in this town. I think someone needs to specialize, especially in some good Mexican chocolate drinks. I think we could have a winner in that. by Erik on 1/5/2010 @ 6:45pm Any word on quality of their hot chocolate? by alwayssancerre on 1/6/2010 @ 8:17am Congrats to all involved! Erik - the term "hipster" makes my skin crawl. Maybe because I am to old to be one. I tried the Smooth and Juicy side yesterday. Nice. by Crenshaw Sepulveda on 1/6/2010 @ 11:21am I like the little lawn they have on the counter. by L.S.Erhardt on 1/6/2010 @ 1:22pm That's wheatgrass. I guess some people drink it. Mmmm... a delicious lawn-flavored smoothie, anyone? I buy wheatgrass every couple of weeks, but not for me. I get it for my cats so they leave the houseplants alone. You know, dandelion leaves are edible, allegedly tasty and full of nutrients. Why don't you ever see dandelions growing in juice bars? *The place was full of... you guessed it, Hipsters. I think I was the oldest person there. *The hot chocolate is good, but not worth writing home about. On the O'Tool Hot Chocolate Index (the OTHCI), I give it a 7 out of 10.
by Emilie has one foot on shore on 1/6/2010 @ 3:34pm Went to Smooth & Juicy this afternoon after a quick lunchtime workout at the Y. Should have budgeted more time for the smoothie! a) Attitude: Upbeat, welcoming personalities behind the counter. Really personable, and clearly striving to help their customers "learn" about the product. The juice guy admitted to not knowing all the drinks by heart, but cheerily showed me "the literature" on all the available boosts. 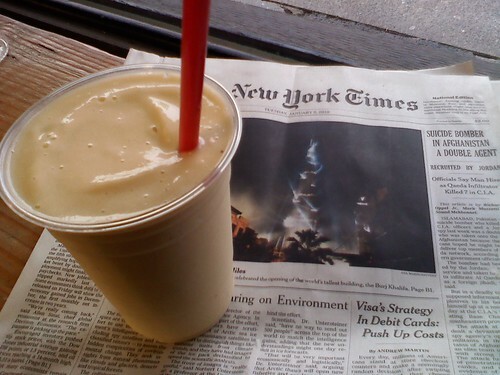 b) Delicious product: I got a 16-ox Green Machine made with avocado, rice milk, pineapple juice, annnd bananas, maybe? In any case, it was fantastic, if a teensy bit thick straight out of the blender. c) Substantial wait time: Don't get me wrong! As is the case with Satellite, I really enjoyed the beverage and I was decently charmed by the nice staff. 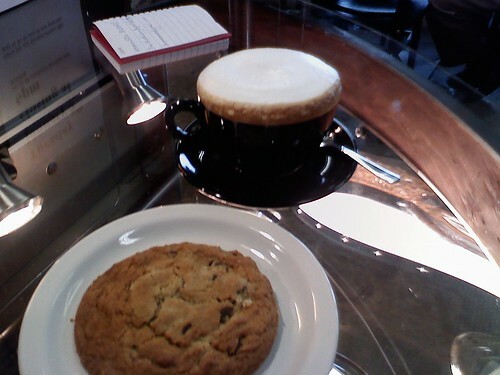 But, like the coffee counterpoint, it won't be n the list of "a quick drop-in." BUT: Yes! I'll be back. And I think you should go too! They're "perfecting recipes" and taking suggestions fow ingredients combos. (I suggested ginger carrot juice, m'self). Just make sure you have the time to enjoy the chill vibe, gaze around the neat space, and wait for your delicious cupful. by Erik on 1/17/2010 @ 11:12am The latest from Satellite. They installed a new bench! by Altered Chords on 1/18/2010 @ 12:35pm alwayssancerre - you're never too old to be a hipster. That's like saying Bret Favre is too old to be a quarterback. by L.S.Erhardt on 1/18/2010 @ 12:37pm I think that was a burn?